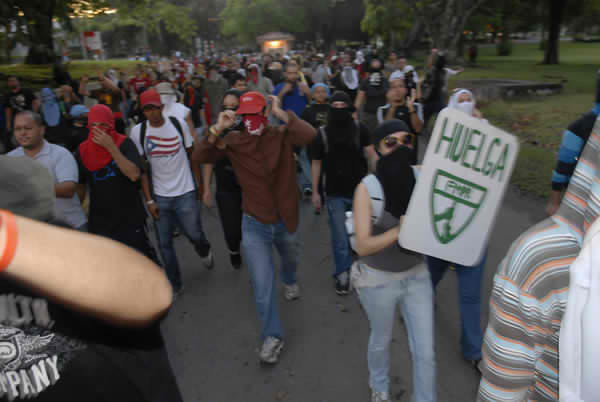 Part 1 in a 3 part series on the University of Puerto Rico student strike of 2010. At the Mayagüez campus, the UPR system’s second largest, the student body was split during a massive assembly plagued with irregularities on the part of the Student Council President, an operative of the governing party. As a result, campus operations have not been shut down, although militant students are organizing resistance. At the Arecibo campus, similar dirty tricks on the part of the Student Council were nearly successful, but students were able to turn the tide, and a campus occupation is now ongoing. At the Bayamón campus, the Chancellor attempted to impede the Assembly by replacing it with an electronic “referendum”, but students upheld their rights and approved a 48-hour occupation. Dozens of students sought to disrupt work Tuesday at the University of Puerto Rico’s main administrative offices in Río Piedras in a protest over looming $800 quotas. In the wake of the two-month student strike that crippled the spring semester, the university community is facing a new conflict this term as the UPR Board of Trustees has said it will begin levying an annual $800 per student special fee starting in January aimed at getting the public institution through its financial problems. Students have already approved a resolution to strike over the special fee, but UPR administration officials say the $40 million the quota will raise is essential to confront a deficit of nearly $200 million the system faces for fiscal 2011, which started July 1. According to a Puerto Rican poster on alasbarricadas the students will be on strike again early in the new year.